It's been a while since my last beauty product review. I just updated my vanity kit, therefore I have new make up and lipsticks. New because it's my first time to buy and use them, and to see if they work on me, I will try to make a review of every item. Here's the first. This is my photo without lipstick. Ok, I know I need more sleep, so please never mind my eye bags. LOL. 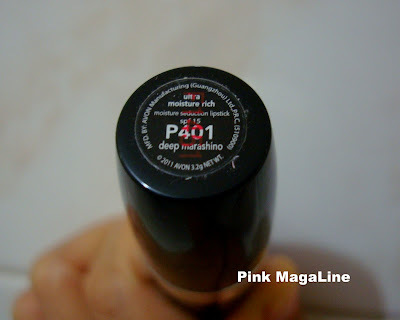 This is the shot with Avon Ultra Moisture Rich Seduction Lipstick in Deep Marashino. 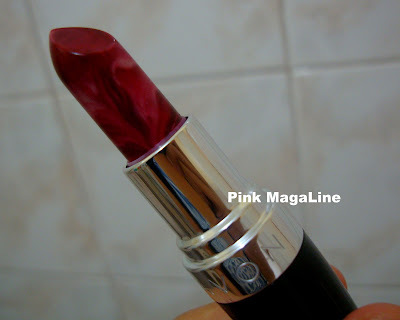 I first applied Maybelline Lip Balm in strawberry as a base. Swatches. Without flash on the left and with flash on the right. Notes about this product:-It doesn't leave my lips dry.-The color looks nice on my pigmented lips.-Price is very affordable.-I look pretty with it so.. I will buy it again! Oh hey, I want to improve my skills in applying makeup and lipstick. I think, my workshop with Reiva Cruz of MUD is not enough. 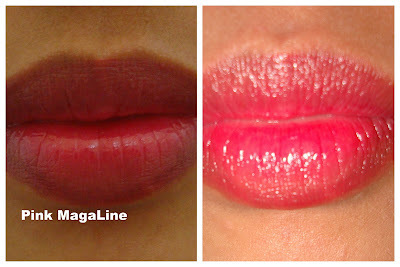 If you have special techniques in applying lippies, please feel free to share them in your comment. I will really appreciate it. Yeah. That's why I like it! it has really been a long time since i last used avon. got to try one again:-).